The last race of the season is here. The final four is set. Now it is time to crown the 2018 MENCS Champion. It should be a great battle between the four best drivers from the 2018 season. The race can be seen Sunday at 2:30pm ET on NBC. I have received a lot of positive feedback about the Garage Talk Notes. I will be posting the notes again next year and they should be better than ever. I have made a couple new contacts who have agreed to send me info about their teams. With this information, we should easily win our Fantasy NASCAR leagues. Goodyear will bring the same tire they used at Chicago this season. Kyle Busch ran down Kyle Larson to win that race. Kevin Hrvick led 39 laps and finished 3rd. These three teams should like the tire Goodyear brought to the track. Each team will get 4 sets of tires for the 3 practices, 1 set for qualifying and 8 sets for the race. Tires will be VERY important Sunday. 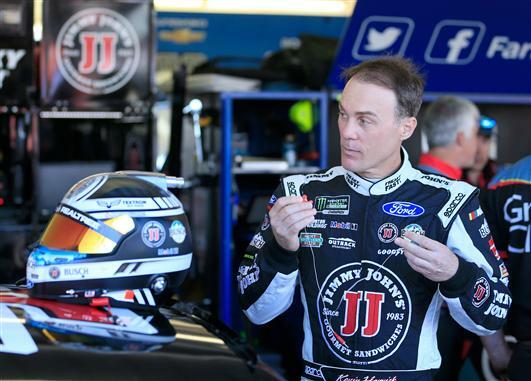 The four drivers competing for the championship (Kevin Harvick, Kyle Busch, Martin Truex Jr. and Joey Logano) released which cars they are driving this weekend. You can see the info in my Final Four Cars article. Chase Elliott: If a non-playoff driver is going to steal a win at Homestead, it could be Elliott. He won at Kansas and he finished 6th at Texas. I would not count out Elliott just because he is eliminated from the playoffs. The No. 9 team started out with a tight race car. Elliott told the team, “Each adjustment is helping. We are definitely going in the right direction.” By the end of practice they were fairly happy with their car. Jimmie Johnson: It has been a horrible season for Johnson. No wins and only 2 finishes in the top 5. I am sure he is ready to start over next year. Johnson has a 21.8 average starting position and a 18.5 average finishing position on the 1.5-mile tracks this season. Johnson opened the morning practice with an 8 lap run and said, “We have a lot of work to do.” He brought the car to the garage and they changed everything but the driver. Jamie McMurray: McMurray will be making his last start in the No. 1 car Sunday. He currently does not have any plans to race in 2019. This will either motivate him to finish on a high note or he has already checked out for the 2018 season. He finished 6th last week at Phoenix so I am guessing he wants to go out with some good finishes. Clint Bowyer: Bowyer had his championship dreams smashed last week when he had a tire go down. I am sure this team will continue to fight in the last race. Bowyer has a 12.8 average starting position and a 13.6 average finishing position on the 1.5-mile tracks this season. Kurt Busch: Busch “may” be competing for the final time in the No. 41 car. I hope he returns to Stewart-Haas Racing in 2019 because it will be his best opportunity to win races. Busch has been very consistent on the 1.5-mile tracks. He has finished 6 of the 10 races in the top 10. He has not finished inside the top 10 at Homestead since 2015 though. Brad Keselowski: There has been no quite in the No. 2 team just because they are eliminated from the playoffs. Keselowski competed for a win at Martinsville and finished 2nd at Phoenix. He is the only driver who has led laps in every playoff race this season. * Joey Logano: Logano will be driving the car Ryan Blaney drove at Las Vegas and Kentucky. This car has never qualified worse than 2nd and never finished outside the top 4. Logano has been very consistent in the playoffs at the 1.5-mile tracks. He finished 4th at Las Vegas (led 46 laps), 8th at Kansas (led 100 laps) and 3rd at Texas (led 54 laps). Homestead ranks as his 4th best track. Logano had the fastest car in the 2nd practice and every consecutive lap chart. He came back in the final practice and smoked the competition. There is no doubt the No. 22 car has been the fastest car this weekend. Ryan Blaney: Blaney will be driving the car Logano won the pole with at Kansas. This car also led 100 laps in the race and finished 8th. Blaney has been very good at the 1.5-mile tracks in the playoffs. He finished 5th at Las Vegas, 7th at Kansas and 2nd at Texas. Blaney has the same setup at Logano. He ran most of his laps in the top 5. Paul Menard: Do not forget about Menard this week. He has been one of the best sleeper picks on the 1.5-mile tracks. Menard has finished 7 of the 10 races in the top 14. He finished 10th at Las Vegas and 13th at Texas, so he has been pretty good at these tracks in the playoffs. Menard ran laps in the top 10 in both practices Saturday. The No. 21 team was working with the Team Penske cars and he found a lot of speed. * Kyle Busch: Can the No. 18 team find the speed to compete with the Fords. Busch has won three races on the 1.5-mile tracks this season (Texas, Charlotte and Chicago) but he has an 8.6 average finishing position at these tracks in the playoffs. The No. 18 car will have the No. 1 pit stall Sunday after it was handed to them from Denny Hamlin’s team. This will be a BIG advantage for Busch in the race. Busch got into the wall in final practice. It looked like cosmetic damage. Erik Jones: Jones has been good on the 1.5-mile tracks this season. He has finished 8 of the 10 races in the top 11. Jones finished 4th at Kansas and 4th at Texas so he will have some momentum entering the race at Homestead. Last year Jones qualified 14th and finished 21st in his first MENCS race at Homestead. I expect much improved results from the No. 20 team Sunday. The No. 20 team practiced a setup at Kansas that all of the JGR cars will use this weekend. Jones was consistently fast this weekend. Denny Hamlin: Homestead ranks as the best intermediate track for Hamlin. He has not finished outside the top 10 at the track since 2012. This will be the last race for Mike Wheeler and Hamlin together as a Crew Chief, Driver combo. This team really wants to go out with a win since they have not found Victory Lane this season. I question their commitment to winning after they gave up their No. 1 pit stall to Kyle Busch. Daniel Suarez: Suarez will be competing for the last time in the No. 19 car for Joe Gibbs Racing. Suarez has not signed a deal yet for the 2019 season but the rumors have him in the No. 41 car for Stewart-Haas Racing. Suarez has not been very good at the 1.5-mile tracks this season. His average starting position is 12.7 and his average finishing position is 19.9. Suarez started 10th and finished 34th in his only start in the MENCS at Homestead. The No. 19 team used the setup from the No. 11 car in Final Practice and he went to 9th on the speed chart. * Martin Truex Jr.: This will be the final race the No. 78 team of Furniture Row Racing. They will be bringing the car that Truex drove at Kentucky. The car won the pole, led 174 laps and went to Victory Lane. This team has nothing to lose so they will do everything possible to win Sunday. It will be hard to root against the No. 78 car Sunday. The No. 78 team decided not to use their radio in practice. They did not want any other teams to listen to what they were saying about their car. Therefore I did not receive any info on the No. 78 car. Ryan Newman: This will be the last race for Newman in the No. 31 car before he goes to Roush Fenway Racing next year to drive the No. 6 car. Newman only has one finish in the top-10 on the 1.5-mile tracks this season (Las Vegas in September). His average starting position is 15.2 and his average finishing position is 20.3 at these tracks. Ty Dillon: It has been a horrible season for Dillon. I am surprised he is returning to the No. 13 car in 2019. I am sure Grandpa could have bought him out of his contract. Dillon has not finished any non-plate races in the top 10. He has competed in 3 races in the MENCS at Homestead. He finished 23rd, 33rd and 26th. Darrell Wallace Jr.: Wallace will be making his first start in the MENCS at Homestead. He has competed in 2 races in the Xfinity Series at the track and he finished 10th and 11th. Wallace has not been very good on the 1.5-mile tracks this season. His average starting position is 24.2 and his average finishing position is 23.9. Ricky Stenhouse Jr.: Stenhouse has been one of the most inconsistent drivers on the 1.5-mile tracks this season. It seems like he either crashes or finishes in the top 10. It is hard to put your fantasy team in the hands of Stenhouse. He has competed in 6 MENCS races at Homestead. His average starting position is 16.3 and his average finishing position is 25.3. Homestead ranks as the 3rd-worst track for Stenhouse. Matt Kenseth: This will likely be the last race for Kenseth in NASCAR. It would be nice to see NASCAR honor him the way they did Tony Stewart, Jeff Gordon and Dale Earnhardt Jr. Kenseth has not competed in any of the 1.5-mile races in the playoffs. Trevor Bayne finished 13th at Las Vegas, 30th at Kansas and 21st at Texas. You would think Kenseth could do a lot better than that.